Roughly 70 percent of student borrowers who have allowed their loans to go into default could have qualified for income-based repayment plans and avoided the high fees, bad credit and other miserable repercussions of failing to repay a student loan on time. That's why the Department of Education and the Consumer Financial Protection Bureau are floating a new idea -- the Payback Playbook, a personalized guide to student loan repayment options. "One in four student borrowers are delinquent or in default and it does not have to be that way," said Richard Cordray, director of the CFPB. "Borrowers have the right to choose among different plans, but they need to know what their options are. They need better information." The proposed playbooks would send borrowers straightforward messages when they start repayment or get behind. Someone who had failed to pay on time, for instance, might get a message saying: "Your account is 90 days overdue. 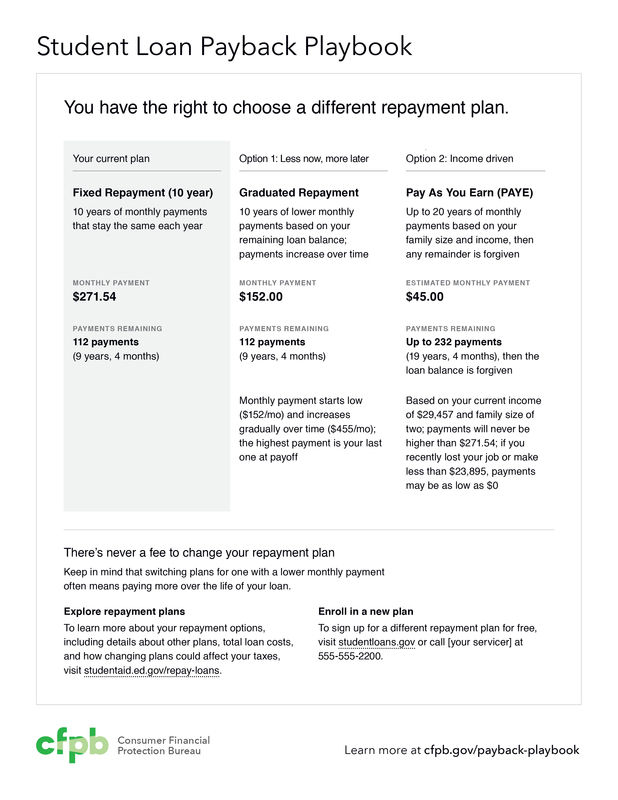 You can lower your payments with a new payment plan." The notice would then describe the borrower's other repayment options, with specific payment amounts based on the borrower's loan balance and interest rate. Likewise, when students first graduate college, triggering a six-month window before they must start repaying their student loans, the playbook would presumably help them make sense of the vast array of repayment plans presented to them. At present, there are eight different formulas to repay a student loan, including four different income-driven plans, which set loan payments based on the borrower's discretionary income. The wide variety of options and qualifications for each repayment plan are understandably befuddling, Cordray acknowledges. There's a move afoot to urge Congress to consolidate some of the different income-based programs into one. But, for the moment, recent graduates need to negotiate a dizzying array of choices. The agencies hope the proposed Playbook will help reduce confusion, but it's unclear when the Playbooks might be provided to borrowers. At the moment, the idea is in an open-ended comment period where both consumers and industry can weigh in about how the program should work. The government has launched new websites for consumers to view the Playbook prototypes and to comment. In the meantime, graduates having trouble repaying student loans are urged to call their lenders to learn about flexible repayment options. "We are moving to a one-stop shop where borrowers can better manage their loans," says Secretary of Education John King. "Getting good information out early is critical. That's what this program is about."